The Mawddach rises to the north of the Rhobell Fawr Mountain and flows through Ganllwyd, Llanelltyd and Penmaenpool and on through its long estuary to the sea at Barmouth. On the Mawddach, as with most other rivers in Gwynedd, there is a marked contrast between the upper reaches - steep and rocky, requiring great care in wet weather - and the gentler lower reaches, some of them quite short, where the course meanders through meadows or woodland. The Mawddach's largest tributary is the Wnion, a very fine sea trout river, while the smaller River Eden is also a valuable game fishery. Following a major pollution in 1984, when 2000 adult salmon and sea trout were killed along with many thousands of juvenile fish, The Mawddach Trust was formed to restock the river from a purpose-built hatchery. 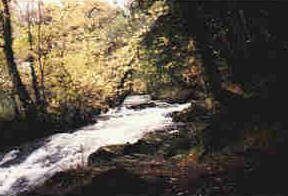 The Mawddach and its tributaries contain neither grayling nor coarse fish. 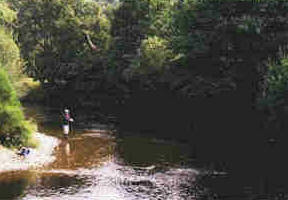 As a result, coarse angling in this part of Wales is confined to stillwaters. Apart from some early season olives and the ubiquitous iron blue and blue-winged olive, it is to the sedge flies, stoneflies and, in particular, terrestrial insects that river trout fishers should turn their attention on the Gwynedd rivers, and the Mawddach is no exception. Salmon and sea trout: 20 March to 17 October. Fly and spinner only from 20 March to 15 April and from 7 October to 17 October. Wnion, Dr Williams' School footbridge below Dolgellau. On these lower reaches the trout-fishing season dates are 31 May to 30 September. Note: Please check the Environment Agency Wales latest edition byelaws booklet before you go fishing, as changes may have occurred since our information was last updated.